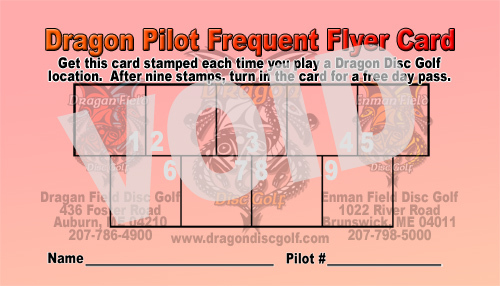 For our frequent flyers, we offer a card to have stamped every time you play at Dragan Field. Fill the card with stamps (nine times) and turn in a complete card for a free day pass. There is no time limit on filling the card, either. If it takes you two years to fill it, it takes you two years. Note: Stamps are only given for full price rounds paid in the Pro Shop during regular hours. Fees paid in the Honor Box are not eligible for Frequent Flyer stamps.